My favourite songs - Little People, Do You Hear The People Sing?, One Day More, and On My Own. 1994, Kallang Theatre, that was where I had my first musical experience. The musical that I watched was Les Misérables, and I was 12 years old then. Les Misérables has always been my favourite musical. That is why when Les Misérables came back in 1996 again, I jumped at the chance to go watch it again. And if I get the chance to, I'd love to watch it again. Why do I love watching musicals so much? Well, that's because I feel that music accompanied by a powerful and emotive singing voice can convey so much more than spoken words can. In real life, people don't break out in song like they do in musicals, that is why I feel that when I watch a musical, I am transported into another world and I am fully immersed in the story. So instead of just watching on the sidelines or from the outside, I feel like I am part of their story. What I love about Tom Hooper's Les Misérables? I feel like I am watching the musical for the first time. When I watch a musical, if I can afford it I will try to get seats as close to the stage as possible. This is because I like to be able to see the expression on the performers' faces as they sing. However, it doesn't happen often because front row seats are very expensive. And when you sit right in front, you see the expression, but have problems taking a step back to see the big picture and everything that's happening on stage. This film gives us both. And that is what I love about it. Some might find the many close ups disconcerting. But I think that IS the whole point. Les Misérables is a musical that makes you feel anger, love, sadness, disgust, hate, frustration, and helplessness. And often times when you see a musical, you can only hear the emotions through the actors' singing voices. But with his close ups in Les Misérables, Tom Hooper is giving you the very exclusive and special opportunity to see and hear the emotions the actors are trying to convey. The actresses that nailed it perfectly in Les Misérables is Anne Hathaway with her song I Dreamed A Dream. And for the men, I'd say that Eddie Redmayne's performance during the song Empty Chairs At Empty Tables was really touching. Because Tom Hooper filmed the actors singing live, we are able to enjoy a brand new version of Les Misérables. The actors give us a fresh interpretation of their character's emotions and a new understanding of what they are trying to say through song. Now Tom Hooper's Les Misérables is not the first feature film to be adapted from the Victor Hugo's novel of the same name. 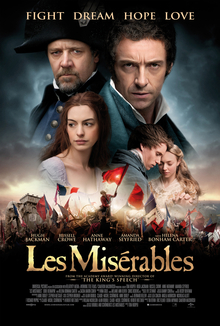 In 1998, Les Misérables was made into a film starring Liam Neeson as Jean Valjean, Geoffrey Rush as Javert, Uma Thurman as Fantine, and Claire Danes as Cosette. So you can only guess how excited I was when I first heard they were going to make another Les Misérables film with Anne Hathaway one of my favourite actresses of all time. From the moment I saw Hugh Jackman's Jean Valjean on screen with the other prisoners I started to get emotional. I loved every minute of the film. The set, the costumes, the make-up were all excellent! The actors all did a great job in their roles. In terms of the singing, I think Anne Hathaway was able to sing and act and did a fantastic job as Fantine. But while Hugh Jackman managed to hit the nail on the head in terms of the emotions with the acting, he was not as great with the singing. And with Russell Crowe, he was able to sing the words and carry a decent tune, but I felt less conviction and emotion in his singing and acting. In fact, I sense he is concentrating on getting the words out rather than focusing on the emotions of the song. Amanda Seyfried once again astounds me with her ability to hit all the really high notes as Cosette. And I was pleasantly surprised to find that I throughly enjoyed Eddie Redmayne's Marius both in the singing and acting department. Samantha Banks' Éponine really made my heart break as well especially when she was singing On My Own. And of course how can I not mention Helena Bonham Carter and Sacha Baron Cohen as the Thénardiers. These two really did a fantastic job in their respective roles. I especially loved the part when Sacha Baron Cohen's character could not remember Cosette's name properly. It made me laugh out loud despite the fact that Les Misérables is really quite a tragic tale. But singing aside, I think every actor in the film did a tremendous job in the film. I also have to comment on the excellent performances by Isabelle Allen and Daniel Huttlestone who play young Cosette and young Gavroche respectively. Both have performed in the actual musical in England. In terms of the story, well, I love it because its about the human condition. It's something everyone can relate to. We have Jean Valjean a man who is a victim of his circumstances who makes me think about all the people who turn to a life of crime in desperation. It also makes me ask myself what would I do in their shoes? Would I keep to the moral code and die or steal to survive? There's Javert who is the opposite of Jean Valjean, he sacrifices everything to live by his strict moral code. He see black and white and leaves no room for grey areas. But life isn't black and white isn't it? My heart goes out to Jean Valjean for the circumstances that lead him to steal a loaf of bread, and while I do not blame Javert for his unbending because he is true to himself, I am disappointed with his inability to empathise. It isn't just about the women of those times. Les Misérables is also a commentary about the political situation of the time, the plight of the poor, and the ignorance of the rich or upper class people. It's about having dreams and hopes of liberation and revolution. It's a story about brotherhood and youthful aspiration. It's about young love and familial love. And it's all about the blurred the lines of right and wrong. I feel that Les Misérables is such a compelling tale and such a success because it takes you on a roller coaster ride of highs and lows, action and reflection. And all this is done by the wonderful and intricate weaving of various story lines, sewn together by beautiful and meaningful lyrics and emotive tunes. What a wonderful musical film Tom Hooper and his great cast has given us! On a side note: If you want to find out what's different between the film and the musical check out this article on The Artifice. (1) Tom Hooper has directed films like The Damned United (2009), The King's Speech (2010), and Les Misérables (2012). (2) Hugh Jackman has acted in films like X-Men (2000), Kate & Leopold (2001), Someone Like You (2001), Swordfish (2001), X2 (2003), Van Helsing (2004), The Prestige (2006), The Fountain (2006), Scoop (2006), X-Men: The Last Stand (2006), Australia (2008), X-Men Origins: Wolverine (2009), Snow Flower And The Secret Fan (2011), Real Steel (2011), Butter (2012), Les Misérables (2012), and The Wolverine (2013). He also voice the character of Memphis in the animation Happy Feet (2006) and Roddy in the animation Flushed Away (2006). He has also performed in musicals like Carousel and The Boy From Oz. (3) Russell Crowe has acted in films like L.A. Confidential (1997), Gladiator (2000), Proof Of Life (2000), A Beautiful Mind (2001), Master And Commander: The Far Side Of The World (2003), Cinderella Man (2005), A Good Year (2006), 3:10 To Yuma (2007), American Gangset (2007), State Of Play (2009), Robin Hood (2010), Man Of Steel (2013), and Noah (2014). (5) Helena Bonham Carter has acted in films like Merlin (1998), Fight Club (1999), Planet Of The Apes (2001), Big Fish (2003), Lemony Snicket's A Series Of Unfortunate Events (2004), Charlie And The Chocolate Factory (2005), Harry Potter And The Order Of The Phoenix (2007), Sweeney Todd: The Demon Barber Of Fleet Street (2007), Harry Potter And The Half-Blood Prince (2009), Terminator Salvation (2009), Alice In Wonderland (2010), Harry Potter And The Deathly Hallows - Part 1 (2010), The King's Speech (2010), Harry Potter And The Deathly Hallows - Part 2 (2011), Dark Shadows (2012), and The Lone Stranger (2013). She has also voiced the character of Lady Tottington in the animation Wallace & Gromit: The Curse Of The Were-Rabbit (2005), and the character of Emily The Corpse Bride in the animation The Corpse Bride (2005). (6) Sacha Baron Cohen has acted in films like Ali G Indahouse (2002), Talladega Nights: The Ballad Of Ricky Bobby (2006), Borat (2006), Sweeney Todd: The Demon Barber Of Fleet Street (2007), Brüno (2009), Hugo (2011), and The Dictator (2012). He also voiced the character of King Julien XIII in the animations Madagascar (2005), Madagascar: Escape 2 Africa (2008), and Madagascar 3: Europe's Most Wanted (2012). (7) Amanda Seyfried has acted in films like Mean Girls (2004), Alpha Dog (2006), Mamma Mia! (2008), Chloe (2009), Dear John (2010), Letters To Juliet (2010), Red Riding Hood (2011), In Time (2011), Gone (2012), The Big Wedding (2013), and Lovelace (2013). She also played the role of Sarah Henrickson in the television series Big Love (2006-2011) and guest starred in television series like Law & Order: Special Victims Unit, Veronica Mars, House, and CSI: Crime Scene Investigation. (8) Eddie Redmayne has acted in films like Like Minds (2006), The Good Shepherd (2006), Savage Grace (2007), Elizabeth: The Golden Age (2007), The Yellow Handkerchief (2008), The Other Boleyn Girl (2008), and My Week With Marilyn (2011). (9) Samantha Banks came in 3rd in the BBC talent show I'd Do Anything in 2008. Les Misérables (2012) is her film debut. She has also performed in musicals like Cabaret, Aladdin, and Oliver!. She also played Éponine in the 2010-2011 West End production of Les Misérables at the Queen's Theatre and at the Les Misérables: 25th Anniversary Concert in 2010. (10) Aaron Tveit has acted in films like Ghost Town (2007), Howl (2010), and Premium Rush (2012). He also played the recurring role of William "Tripp" Vanderbilt III in the television series Gossip Girl (2009-2012), and guest starred in television series like Ugly Betty, Law & Order: Special Victims Unit, and The Good Wife. He has also performed in musicals like Hairspray, Wicked, Catch Me If You Can and Rent.